Despite being the capital city, parts of London do have poor digital connectivity. Access to, and affordability of, high speed internet are problems particularly in central and east London as well as other pockets of poor coverage (see map below). parts of London are rural, where commercial viability is more challenging. The City of London has developed The Standardised Wayleave Toolkit. This will speed up the installation of broadband for businesses and all parties will benefit from lower costs and more efficient ways of working. Whilst developed by the City of London, the Toolkit can be used by all and any broadband providers, businesses, landlords and developers operating anywhere in London (and the rest of the UK). The Toolkit comprises of a series of legal templates together with guidance on how to use them, and who needs to be involved. To use the Toolkit, please go to the City of London's website, where all the documents can be downloaded. 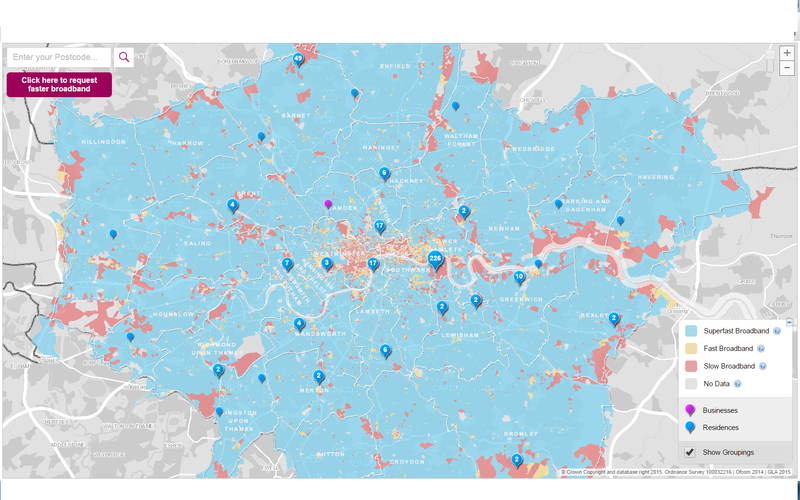 The Greater London Authority has published an interactive Connectivity Map showing London's broadband coverage. We will be working with the GLA's notspots team to help borough identify solutions to challenging broadband conditions in their locality.